Braaaaaaaains! Uh… I mean, beeeeeeeeeeer! If you’re a fan of delicious IRAs and/or are a fan of the series “The Walking Dead“, then Ninkasi Brewing may just have the beer for you. Ninkasi’s Dawn of the Red IRA will be heading your way in January, 2014. Careful though. Just one sip and you’ll become….. The Walking Red! EUGENE, Ore.—Dec. 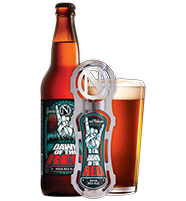 16, 2013—Ninkasi Brewing Company announces the release of its Dawn of the Red, an India Red Ale, to store shelves and on-draft January through April 2014. Crafted as part of Ninkasi’s Special Release Series, this beer embodies all aspects of the creative process that goes in to each and every Ninkasi brew – from the brewing and recipe design team to its in-house art department. On the bottle, consumers will find a label that draws from the cult classic zombie movie, “Dawn of the Dead,” a flick favored by the label’s designer and Ninkasi art director, Tony Figoli. “We’re all about mash-ups here at Ninkasi, so I thought what better than a pop-culture reference tied with a little rock n’ roll,” says Figoli. Dawn of the Red will be available on shelves in 22-ounce bottles, in Ninkasi’s 22-ounce Variety 4-Pack, and on-draft January through April. Tasting Notes: Mango, papaya, pineapple and stone fruit notes burst out with bitterness upfront. Sustained by a subtle malt-flavor, this beer finishes smooth, leaving one ready for the next sip of this flavortastic beer! 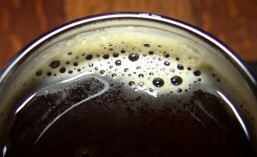 To view Ninkasi’s full line-up of Special Release Series beers, visit: www.ninkasibrewing.com/beers. Dawn of the Red IRA is part of Ninkasi’s Special Release series and will be available in 22oz bottles and on tap through April 2014. According to Ninkasi: “This beer has quickly become a favorite here at the brewery due to its tropical notes and drinkability.” Better Red than Dead, right? This entry was posted in Beer, Beer Release, Brewing, Oregon, Winter and tagged 2014, beer, Beer Release, January, Ninkasi Brewing, Oregon. Bookmark the permalink.